I’m enjoying lifestyle inflation in my pursuit toward living from paycheck to paycheck. Last time I talked about making latte with freshly roasted coffee beans instead of beans in a bag from grocery stores. This time I want to talk about getting fresh organic vegetables from a CSA. CSA is Community Supported Agriculture. It’s basically a subscription program run by a farm. They put together a box of in-season vegetables (sometimes with fruit) every week. They deliver the boxes to a distribution point in the neighborhood. You go get your share from the distribution point. This cuts out the grocery stores and distributors. The farm does more of the distribution work. It gets more money for their produce. As a consumer I get fresh in-season produce from a known source. Putting more money into the farmers’ pocket also feels good. It’s more expensive than buying from grocery stores, but I like it. There, lifestyle inflation again. But it’s good lifestyle inflation. Eating fresh in-season organic vegetables from a known source is an experience. If you buy produce from a store, even from an expensive store like Whole Foods, you don’t know where the produce came from or how long it stayed in the layers of storage and distribution. If you pay attention you see some came from outside the country, organic or not. Most of the money you pay no doubt goes to the distribution chain. The actual farmer in Mexico gets very little. I would rather support the local farmers than corporate distributors and stores. With a CSA, I eat what they pick. They pick the day before delivery. Short of growing the vegetables yourself, which I may try one day, you can’t get any more fresh than that. When paid in advance, my box comes out to $22/week for 7 or 8 items. If I get similar items from a store it might cost $15. I prefer spending the extra money for better quality. You can find CSAs near you by just googling CSA and your nearby city. The reverse latte factor works really well. I like good lifestyle inflation. Good stuff, Harry – I’m a relatively new reader of your work, but as a farm kid from Southern Ohio currently stationed in suburbia and enjoying our own CSA experience, I wanted to echo your sentiments. We’ve gone the CSA route the past two years, and figure it’s only marginally more expensive to go with the CSA than it is to pick up our fresh produce at the grocery. 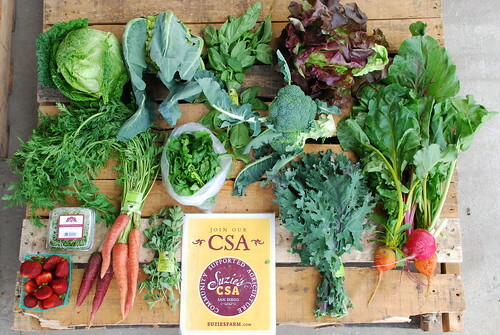 Everything else you’ve said about the benefits of a CSA, however, are spot on. We still use our grocery, of course, because the CSA doesn’t necessarily give us everything we want in any given week, but ours has been a very positive experience. I applaud the personal choice, although our household is behind on these things (have not investigated subscription options, but my wife’s ‘hobby’ is healthy eating). I was also struck by your linked ‘living paycheck to paycheck’ post – many financially successful people seem find that they cannot bear to spend a little more after years of being frugal, although they are better off than they probably ever expected and by all reasonable accounts could. Nice to see someone carrying the flag for ‘allowing’ a little lifestyle inflation (once the finances can support it and the lifestyle choice is a conscious choice, etc.). I don’t care so much about vegetables but am really interested in organic, hormone free meat. Any ideas where it would be available in the Bay Area? Grow your own! It’s fun and easier than you may think. And the taste of veggies directly from the backyard garden to the table…it really is a step up. Surprised I never noticed this blog until a few days ago. I’m a first time commenter here, but have followed a few others like Simple Dollar and 20 Something Finance off and on for several years. Regarding your CSA, it sounds like you’d rather be getting your money’s worth. There is considerable variance among these programs and the terms of their agreements. I invested some time checking out all our options using the same localharvest.org site that Steve suggested above. The one we joined (in Cincinnati, fwiw) provides about 15 items for $20/delivery. I haven’t done a cost comparison, but it seems to be on par with grocery prices, if not cheaper. A couple other benefits that I’ve found: we wouldn’t buy this much produce normally, so it’s our way of enforcing a healthier diet and investing in our health. It also means fewer trips to the grocery, which we all know is key to cutting out some of the miscellaneous spending. That’s made the CSA a budget-positive item even without the subjective benefits.